WTF?!?! I don’t understand how this would in any way help the patient. In fact, if I were there, I’d probably feel even more sick than I already was. There’s a Star Trek themed dentist’s office in Orlando Florida and while I’m certainly no Trekkie (or Trekker if you prefer) I can see that. Is this part of the recent Kitty Labs exhibit recently in Hong Kong? Mr HKH may you be strapped down on the Hello Kitty examination table to receive Hello Kitty shock treatment for your war against the cute one. It looks a little too stark foo a Hello Kitty Room. Jesus wept. That is all. Oh, that is too bizzare ! Perhaps it would help to focus on Hello Kitty’s fractured rib and maybe imagine that you broke it with a swift kick? Okay, this is way too scary. @ Valencia: nice Very nice. Now upgrade it to a fractured neck and we’re getting somewhere. That’s a little freaky to me…even loving HK, I don’t think I would like that. In fact, all the people who dislike HK should like it – it’s almost a gallery of HK death! However, if they made it more HK-like (cute, pretty, pink, etc – and less death-like) it could help patients – especially in the pediatric field. 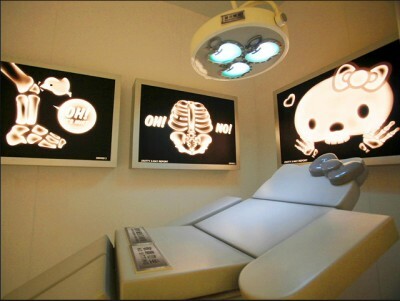 I’m a nurse and I’ve been in some very high-end pediatrics offices and many of them are decked out like this one – but instead of HK-death, it’s usually Winnie the Pooh or trains or fruit – something a long those lines. The concept is great but the portrayal is not. I think my 2 yr old would be scared to death and she’d probably cry over “dead hewwo kitty”. I would jump out and run from that clinic even with my broken leg. How would you like to die in THAT?